Police are appealing for witnesses after a 63-year-old woman was struck by a cyclist in Eastbourne. 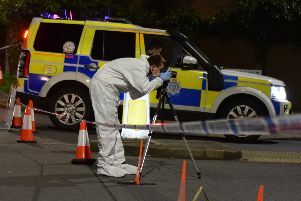 The local victim had just stepped from a car onto the pavement in Langney Road when the incident happened at about 6pm on Wednesday (April 4). Police say she was knocked unconscious temporarily, and suffered facial injuries and a suspected fractured left wrist. She was taken to Eastbourne District General Hospital for treatment. The cyclist, believed to have been travelling west on the pavement between 15mph and 20mph, remained at the scene for a short time, but then made off without leaving his details. He is described as white, aged about 25, of slim build, wearing a grey hoody with the hood up and grey jogging bottoms. He was riding a mountain bike. Officers are appealing for witnesses, anyone who may know the cyclist, or the cyclist himself to come forward. You can report it online quoting serial 1017 of 04/04.